Freedom Laser Therapy joins forces with Health & Fitness Expert Peter Nielsen to Launch Weight Loss Clinical Research Trial. Freedom Laser Therapy is now offering a weight loss laser therapy clinical research trial. Freedom is combining: low-level laser therapy, which may aid in suppressing appetite and speeding up the body’s metabolism, and the expertise of International Fitness and Bodybuilding expert Peter Nielsen. Peter has created an informative lifestyle changing weight loss program for Freedom Laser Therapy. During the low-level laser therapy session the client watches Peter’s 15-minute weight loss instructional video about his own principles of healthy living. The client receives guidance on nutrition and fitness to promote new healthy lifestyle habits. Inclusive in the program is a weight loss support kit, which consists of nutritional supplements, diet plans, exercise tips, and additional items that will assist the client with their weight loss goals. For over a decade, Nielsen has worked toward motivating people to get moving and get fit by adopting the philosophy of keeping fitness simple and fun. Nielsen grew up in Brooklyn, New York. At age 15, Peter was diagnosed with Crohn’s Disease and dropped down to a mere 86 pounds. Very little was known about Crohn’s Disease in 1977 and even doctors were at a loss to tell his family how to fend off the crippling attacks of abdominal pain and bleeding, not to mention malnutrition and all of the other ailments caused by poor nutrient absorption. Nielsen was physically weakened by surgery and mentally discouraged by the disease’s prognosis. The writing on the wall seemed to say that Nielsen’s life was going to be a limited one. Yet, Peter astonished his family, friends and doctors. A pivotal period of soul searching revealed truths to Peter that transformed his attitude toward his health, his body and especially his life. This is the foundation of Nielsen’s message of health and fitness. Peter Nielsen is providing exercise, nutritional, motivational and educational materials to help patients maintain a healthy lifestyle. Peter Nielsen is not directly affiliated with the laser therapy clinical research trials. 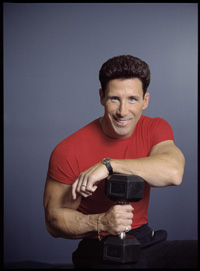 Peter Nielsen-International Health & Fitness ExpertFor 25 years, Nielsen has lived a lifestyle of total fitness, and he is passionate about helping others to live the same way. Weight Loss Low-level Laser Therapy SessionLaser Therapy may speed up the body's metabolism to promote weight loss.